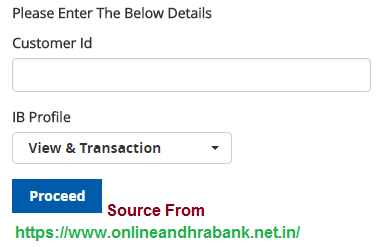 Andhra Bank AB Online Net Banking New Retail User Login Registration at onlineandhrabank.net.in website…..
Actually Andhra Bank launched a new application for smartphone users i.e named as Andhra Bank app. In this app you can transfer money from Internal Account Transfer and Other Bank account transfer. And also you can check the mini statement, account summary also. In the Net Banking website you can get these facilities like Cheque Book Generate, Online Transfers, Debit Card Applying, Credit Card Applying, Fixed Deposit Details, Open FD online etc. Click on Retail Self Signup button. If you select either Mobile Number Registered with Bank or You have a valid (Active) Andhra Bank ATM Card or you can select both options. Click to continue button. Coming to next page you must enter your customer id as printed on your bank passbook. Choose your Internet Profile to View and Transaction option. Then You can enter confirm your Mobile Number. Type your Registered Mobile Number within the bank and you can get One Time Password. Enter into the box. Click on Validate button. After you can fill the required fields like User ID, Password, Transaction Password / Profile Password.